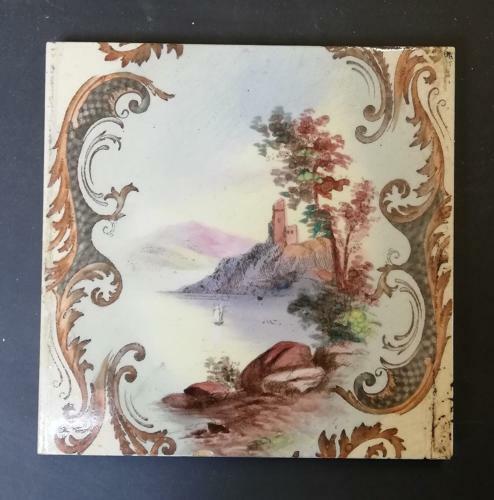 A set of 10 very beautiful, Late Victorian, hand painted fire tiles. The tiles have a stunning colour and delicate design depicting 2 different landscapes in the centre and beautiful flowers and scrolling leaves surrounding the central designs. The colour of the tiles is clear and unfaded and the design is of a very fine quality. The tiles have the RD number RD 254818 on the reverse, dating them to 1895. The tiles were originally set into a cast iron fire, surrounding the fire opening and they can be used for this purpose again. The tiles would also make a fantastic sink splashback or other interior project. The tiles are antique and therefore have some signs of use and wear. The tile glaze has some crazing and cracking. There are some light smoke marks to the back. One tile has had several breaks and the tile has been repaired, although the cracks can be seen. There are some small chips and knocks to the edges and some small stains. The tiles have fantastic character and a very pretty design, and they are very desirable items.